I miss you messages for ex-wife: Sending a text to your ex-wife can be a risky proposition. It may be a good idea to keep your feelings to yourself. But if you must, make sure you choose your words wisely because the last thing you need is yet another emotional hassle with her. Don’t sound too romantic or else it will seem that you desperately want her back in your life. This post should give you enough ideas to write a sweet note which is warm, yet just short of going all the way and saying I Love You. 1) I love to hate you. I hate that I loved you. 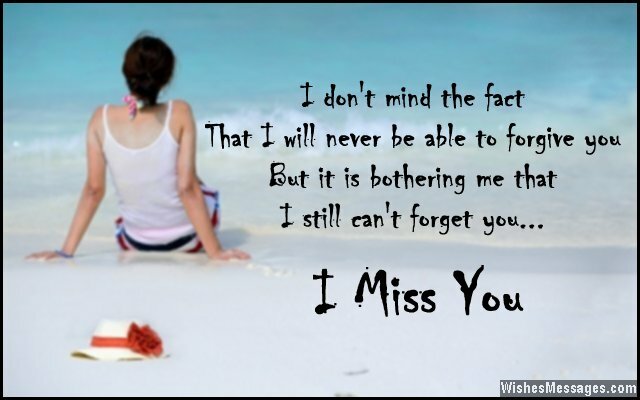 But I still miss you. 2) Maybe our marriage wasn’t meant to be, maybe we both were destined to drown in heartbreak’s sea. Maybe we were meant to go separate ways, maybe it was in our marriage’s destiny to see gloomy days. Maybe you were never meant to be in my life’s view, maybe I was destined to keep missing you. 3) Our fights were bitter, our marriage went sour but our memories will always remain sweet. I miss you. 4) Even though our marriage crumbled apart like a cookie, the crumbs that signify the precious memories will always be sweet. I miss you. 5) Your memories rouse a sweet melancholy of things that should have been and of the things that will never be. I miss you. 6) You are not the only person I miss. I also miss the person that I was when you were around. I miss you. 7) You hated me for what I did, not for who I was. But I will always respect you for what you were and the person that you are yet to be. I miss you. 8 Our divorce was emotionally painful, physically tiring and mentally stressful. But looking back at how it unfolded, it was a life experience which I wouldn’t want to have with anyone else. I miss you. 9) My heart has managed to convince me, that we weren’t mean to be. But the problem is that I haven’t managed to convince my heart, that we have to be apart. I miss you. 10) There is NOTHING that can change the fact that we are now divorced and separated. But there is SOMETHING that changed how I used to hate you. I miss you. 11) Different jobs, different homes, different suburbs, different routines, different lives – everything between us has changed except one thing – we have same history. I miss you. 12) I can claim to hate you all I want but at the end of the day I will always have a soft corner for the woman who is the mother of my beautiful children. I miss you. 13) If there is one advice I can offer all the newly divorced men out there it would be – never expect a piece of paper to help you emotionally separate from the woman with whom you once shared your life, dreams and destiny. I miss you. 14) All these years have taught me one important lesson in life – no matter how much I move on, I will never be able to completely forget the woman who I once loving called MY WIFE. I miss you. 15) Our marriage may have ended but I can never forget the person with whom it all started. I miss you. 16) I don’t mind the fact that I will never be able to forgive you. But it is bothering me that I still can’t forget you. I miss you. 17) NOTHING can erase the bad memories of our divorce. NOTHING can change our turbulent past. NOTHING can undo what happened between us. NOTHING can turn back time and set things right. But there is SOMETHING that takes me back to the happy days. There is SOMETHING that reminds me of the better times. There is SOMETHING that hurts me when I have to refer to you as my ex-wife. There is SOMETHING that makes me say – I miss you. 18) I miss you, not just because you were my wife. But because there was a time when your happiness was the purpose of my life. 19) Our marriage didn’t work out and we may never be on talking terms again. But there are times when I still think about you, despite the pain. I miss you. 20) I don’t think about you like I did before. But I still think about you, something I never thought I would do. I miss you. 21) My heart has moved on and so has yours. But my heart hasn’t stopped missing you and I hope yours hasn’t too. I miss you. 22) I hated you endlessly for making my life so difficult with your presence. 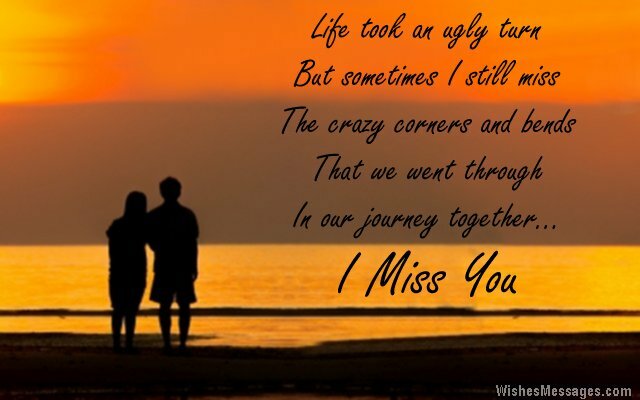 Now I miss you endlessly for making my life so difficult with your absence. 23) I cannot pin down what I miss about you, why I miss you, the way I miss you or how much I miss you. It’s just that I miss you. 24) The bright reds, vivid crimsons and vibrant oranges in the canvas of life have turned a pale hue – all because I miss you. 25) I have been scathed and you have been scarred. I have been singed and you have been charred. I have been scorched and you have been seared. 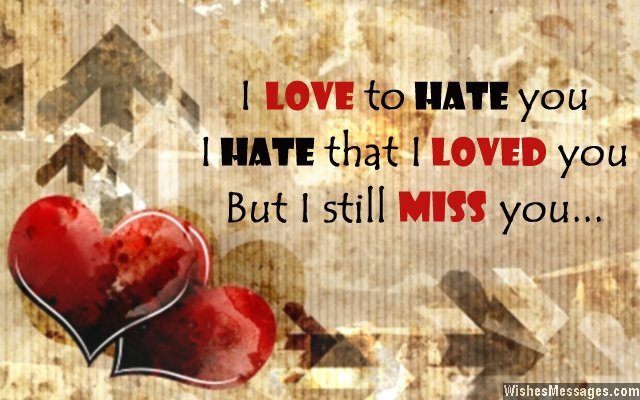 Despite of all this, I miss you and I hope you miss me too. 26) Just like my lungs cannot stop breathing and my heart cannot stop beating at my will, I cannot stop missing you even if I want to. I miss you. 27) It is a pity that a horrible marriage had to ruin our beautiful friendship. I miss you. 28) Our divorce was the worst thing that could happen to us. But the lessons of life it taught was the best thing that could happen to us. 29) Our paths may never cross again and our destinies may never meet, but I will always be just a phone call away when you need me. I miss you. 30) Life will move on but I will never forget my past. The beautiful memories of us will always last. I miss you. 31) Life took an ugly turn but sometimes I still miss the crazy corners and bends that we went through in our journey together. I miss you. 32) First I loved you, now I respect you. First I adored you, now I admire you. First I cared for you, now I think of you. Through all of this, I have missed you. 33) We were perfect, but we just weren’t perfect for each other. I miss you. 34) Even if I want to, I will never forget all the pain you gave me. Even if I don’t want to, I will always remember the fond memories. I miss you. 35) We will never agree on whose fault it was that pull our marriage down into the gallows of divorce. But at least we can agree on the fact that we both still miss each other in remorse. I miss you.